“So if you are offering your gift at the altar and there remember that your brother has something against you, leave your gift there before the altar and go. First be reconciled to your brother, and then come and offer your gift” (Matt. 5:23-24). Be kind to one another, tenderhearted, forgiving one another, as God in Christ forgave you (Eph. 4:32). “Christians are the most forgiven people in the world. Therefore, we should be the most forgiving people in the world. As most of us know from experience, however, it is often difficult to forgive others genuinely and completely. We often find ourselves practicing a form of forgiveness that is neither biblical nor healing” (The Peacemaker, 204). There are two types of forgiveness that we receive from God. First, there is the forgiveness of salvation. And, second, there is the day-to-day forgiveness that restores our fellowship with God. “If we confess our sins, he is faithful and just to forgive us our sins and to cleanse us from all unrighteousness” (1 John 1:9). Having trouble forgiving? Remember God's forgiveness. “The Lord is merciful and gracious, slow to anger and abounding in steadfast love. He will not always chide, nor will he keep his anger forever. He does not deal with us according to our sins, nor repay us according to our iniquities. For as high as the heavens are above the earth, so great is his steadfast love toward those who fear him; as far as the east is from the west, so far does he remove our transgressions from us” (Ps. 103:8-12). The parable of the unmerciful servant (Matt. 18:21-35) teaches us that we are to be willing to forgive the offenses of others. “This parable illustrates an attitude that is all too common among Christians. We take God’s forgiveness for granted, while we stubbornly withhold our forgiveness from others. In effect, we behave as though others’ sins against us are more serious than our sins against God” (The Peacemaker, 217). To understand what forgiveness is, we must first understand what it is not. The truth is, we don’t always feel like forgiving. Forgiveness is an act of the will. But what about Isaiah 43:25: “I will not remember your sins” (cf. Jer. 31:34)? The Bible doesn’t teach divine amnesia. God is saying that he completely forgives. “Forgetting is a passive process in which a matter fades from memory merely with the passing of time. Forgiving is an active process; it involves a conscious choice and deliberate course of action. To put it another way, when God says that he ‘remembers your sins no more’ (Isa. 43:25), he is not saying that he cannot remember our sins. Rather, he is promising that he will not remember them. When he forgives us, he chooses not to mention, recount, or think about our sins ever again” (The Peacemaker, 206). “Excusing says, ‘That’s okay,’ and implies, ‘What you did wasn’t really wrong,’ or ‘You couldn’t help it.’ Forgiveness is the opposite of excusing. The very fact that forgiveness is needed and granted indicates that what someone did was wrong and inexcusable” (The Peacemaker, 206). As the Lord has forgiven you, so you also must forgive (Col. 3:13). Forgiveness is a decision modeled after God’s forgiveness of us. Ideally, repentance should precede forgiveness. Jesus said, “If your brother sins, rebuke him, and if he repents, forgive him, and if he sins against you seven times in a day, and turns to you seven times, saying, ‘I repent,’ you must forgive him” (Luke 17:3-4). What should we do if the offender has not yet repented? We should approach forgiveness as a two-stage process. The first stage is having an attitude of forgiveness. The second stage is granting forgiveness. Both stages of forgiveness were demonstrated by God. On the cross, Jesus prayed, “Father, forgive them, for they know not what they do” (Luke 23:34). Then about 50 days later, Peter preached in Jerusalem (the city where Jesus was crucified), saying, “Repent and be baptized every one of you in the name of Jesus Christ for the forgiveness of your sins” (Acts 2:38). Luke reports that “those who received his word were baptized, and there were added that day about three thousand souls” (v. 41). First, there was the attitude of forgiveness, and then there was the granting of forgiveness. Does forgiveness eliminate the consequences of sin? Not always. Proverbs 19:19 says, “A man of great wrath will pay the penalty, for if you deliver him, you will only have to do it again.” God forgave David for adultery and murder, but God did not spare him from all the consequences that naturally flowed from his sin (2 Sam. 12:11-14; 13:1-39; 16:21-22; 19:1-4). Isaiah 59:2 says, “Your iniquities have made a separation [wall] between you and your God, and your sins have hidden his face from you so that he does not hear.” “Through forgiveness God tears down the walls that our sins have built, and he opens the way for a renewed relationship with him. This is exactly what we must do if we are to forgive as the Lord forgives us: We must release the person who has wronged us from the penalty of being separated from us. We must not hold wrongs against others, not think about the wrongs, and not punish others for them” (The Peacemaker, 209). If you are struggling with forgiveness, Ken Sande suggests the following prayer. “God, I cannot forgive him in my own strength. In fact, I do not want to forgive him, at least until he has suffered for what he did to me. He does not deserve to get off easy. Everything in me wants to hold it against him and keep a high wall between us so he can never hurt me again. But your Word warns me that Unforgiveness will eat away at my soul and build a wall between you and me. More importantly, you have shown me that you made the supreme sacrifice, giving up your own Son, in order to forgive me. Lord, please help me to want to forgive. Please change my heart and soften it so that I no longer want to hold this against him. 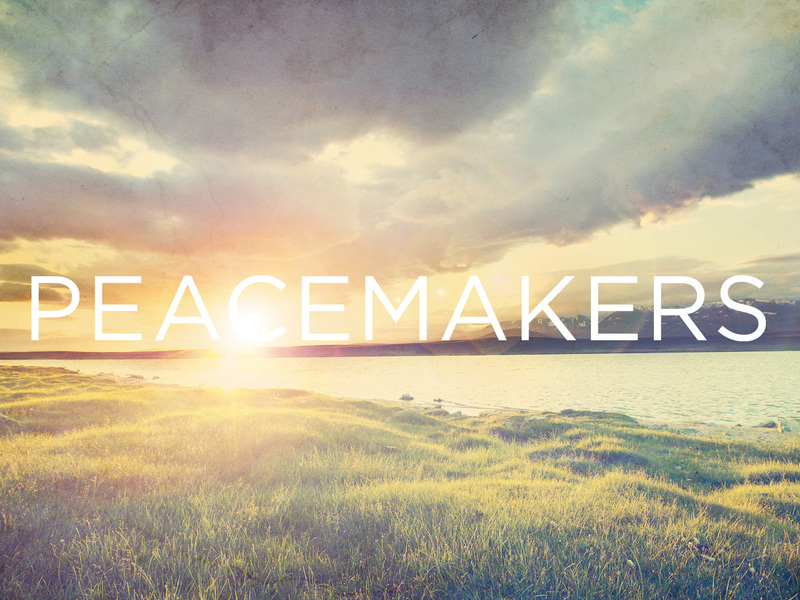 Change me so that I can forgive and love him the way you have forgiven and loved me” (The Peacemaker, 205). Yet live by Him I kill'd. “If your brother sins against you, go and tell him his fault, between you and him alone. If he listens to you, you have gained your brother. But if he does not listen, take one or two others along with you, that every charge may be established by the evidence of two or three witnesses. If he refuses to listen to them, tell it to the church. And if he refuses to listen even to the church, let him be to you as a Gentile and a tax collector” (Matt. 18:15-17). Brothers, if anyone is caught in any transgression, you who are spiritual should restore him in a spirit of gentleness (Gal. 6:1). Sometimes a person’s sin is too serious to overlook. How can you know if a sin is too serious to overlook? Ken Sande suggests that we ask ourselves four questions. First, is it dishonoring to God? Second, is it damaging your relationship? Third, is it hurting others? Fourth, is it hurting the offender? “Although these verses endorse constructive confrontation, they are not a license to be a busybody. The Bible repeatedly warns us not to be eagerly looking for opportunities to point out the faults of others (e.g., 2 Thess. 3:11; 1 Tim. 5:13; 2 Tim. 2:23; 1 Peter 4:15). In fact, anyone who is eager to go and show a brother his sin is probably disqualified from doing so. Such eagerness is often a sign of pride and spiritual immaturity, which cripple our ability to minister effectively to others (Gal. 5:22-6:2). The best confronters are usually people who would prefer not to have to talk to others about their sin but will do so out of obedience to God and love for others” (The Peacemaker, 153). We should remember three biblical principles about confrontation. 1. Be willing to take the initiative. Jesus said, “If you are offering your gift at the altar and there remember that your brother has something against you, leave your gift there before the altar and go. First be reconciled to your brother and then come and offer your gift” (Matt. 5:23-24). “Note that this command is not limited to situations where the other person has something justifiable against you. Jesus said to be reconciled if your brother has something against you, implying that the obligation exists whether or not you believe his complaint is legitimate” (The Peacemaker, 148-9). 3. Be ready to forgive. Jesus taught, “If your brother sins, rebuke him, and if he repents, forgive him, and if he sins against you seven times in the day, and turns to you seven times, saying, ‘I repent,’ you must forgive him” (Luke 17:3-4). “A general principle taught in Matthew 18 is that we should try to keep the circle of people involved in a conflict as small as possible for as long as possible. If we can resolve a dispute personally and privately, we should do so. But if we cannot settle matters on our own, we should seek help from other people, expanding the circle only as much as necessary to bring about repentance and reconciliation” (The Peacemaker, 186). This process of involving others in a conflict may involve five steps. Step One: Overlook minor offenses. Step Two: Talk in private. Go tentatively. “Unless you have clear, firsthand knowledge that a wrong has been done, give the other person the benefit of the doubt and be open to the possibility that you have not assessed the situation correctly. And go repeatedly, if necessary. The Greek word for “go” implies continual action. Step Three: Take one of two others along. “But if he does not listen, take one or two others along with you, that every charge may be established by the evidence of two or three witnesses” (v. 16). Step Four: Tell it to the church. “If he refuses to listen to them, tell it to the church” (v. 17a). Step Five: Treat him as an unbeliever. “And if he refuses to listen even to the church, let him be to you as a Gentile and a tax collector” (v. 17b). Jesus’ use of the word as is significant. Since only God can know a person’s heart (1 Sam. 16:7; Rev. 2:23), the church has no power to decide whether a person is a believer. “Treating someone as a nonbeliever serves three important purposes. First, revoking the person’s membership in the church prevents the Lord from being dishonored if that person continues to act in blatantly sinful ways (Rom. 2:23-24). Second, other believers are protected from being led astray by a bad example or divisive behavior (Rom. 16:17; 1 Cor. 5:1-6). Third, treating someone as a nonbeliever may help the rebellious person to realize the seriousness of his or her sin, turn from it, and be restored to God” (The Peacemaker, 194).